Driving a Go Kart is a fun activity that is catching up in a big way. Feeling the air rushing through your hairs, as the adrenaline kicks in, is an exhilarating and liberating experience. Moreover, Go-Karting is a safe sport. More and more people are enjoying this recreational activity and sports at family fun centers. However, with the prices of Go Karts coming down, it makes more economic sense to buy one. No more doubts and uncertainties; here we present you the top 10 Off Road Go Karts that give you the best value for money, as well as the performance that will thrill you to the core. This list will help you in making it easy for you to add Go Karts to your fun quotient. The MotoTec Off Road Go Kart features a 48 volt 1000 watt motor which enables you to attain speeds of 10, 15 or 20 KMPH. For safety, it is equipped with roll cage safety bars, padded steering wheels, seat belt and hydraulic brakes. On the comfort side, it has adjustable seat. 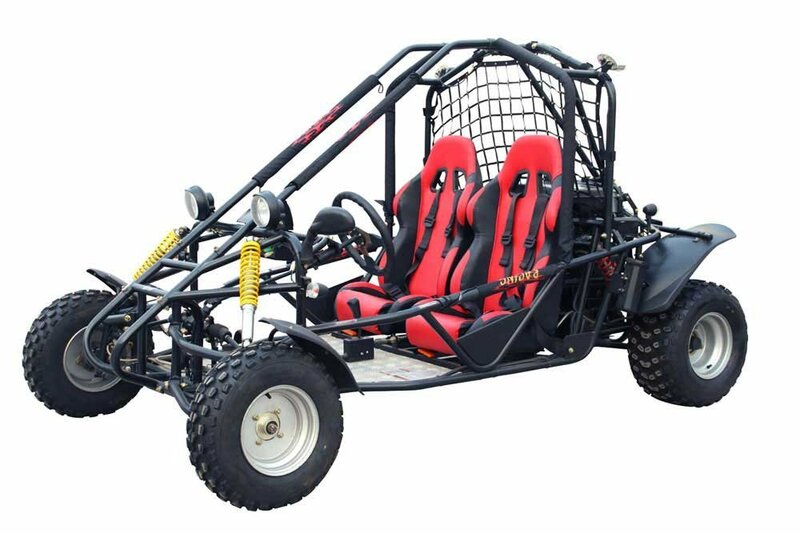 The MotoTec MT-GK-01 is a rugged Go Kart that is made out of High-Tensile Steel Tubular frame and is built to last. It comes with a 90 Day Parts Replacement warranty. This Go Kart is for children above 13 years and adults. Adult supervision and use of safety helmets and safety gear are recommended. The Berg GranTour 2-seater Go Kart is meant for two persons, yet it is a great space saver. It is designed in a way that it can be parked upright requiring only a minimum space. 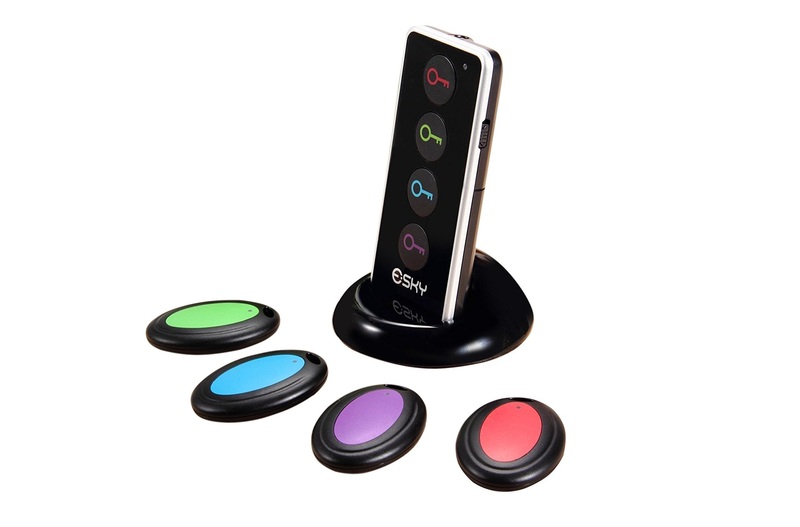 It is made out of high-quality materials and components so it is almost maintenance-free. GranTour has all essential safety features and complies with all safety regulations. 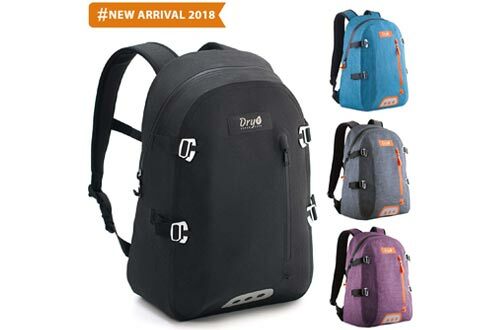 Its light construction makes it ideal for daily use. Being a family off-roader, it provides loads of fun. This Go kart has some mind-blowing features. To start with, it is a double-seater so at any time two persons can enjoy the ride. 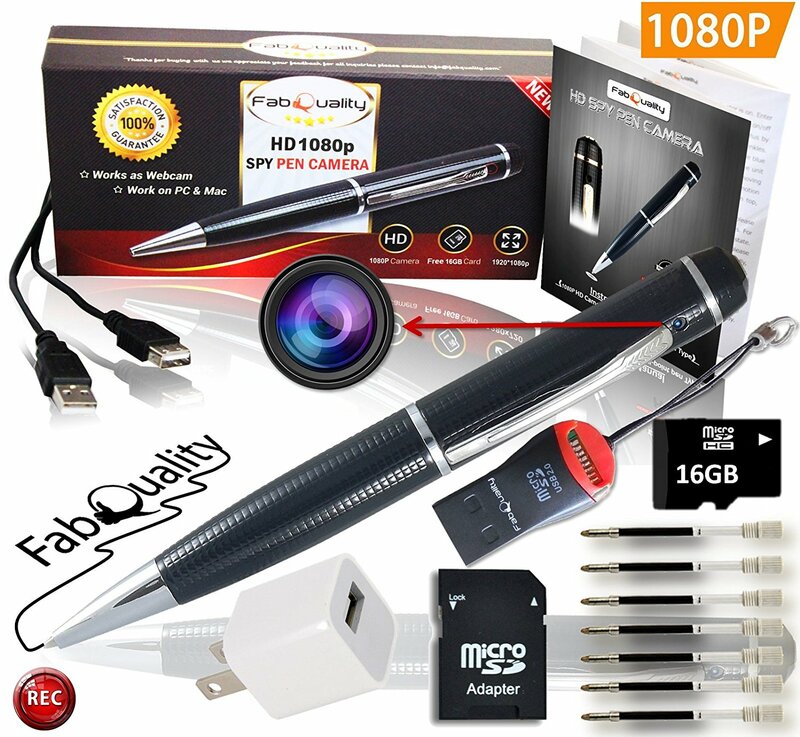 Its specifications are like that of a car. The engine is 4-stroke, single cylinder, air cooled 163cc which delivers 5.5 HP while giving a Max torque of 8 lb ft at 3600 RPM. It is equipped with Automatic CVT Transmission, Rack and Pinion Steering, Disc Brakes, rugged suspension and Dual Wheel Drive. It also has Remote Start. The Trailmaster XRX-R Mini Kids has safety seatbelts, canopy top, speed limiter control and LED headlights. This Go Kart can achieve a maximum speed of 12.4 miles per hour. The Kandi Go Kart has the most exciting design, giving it a Formula One look. 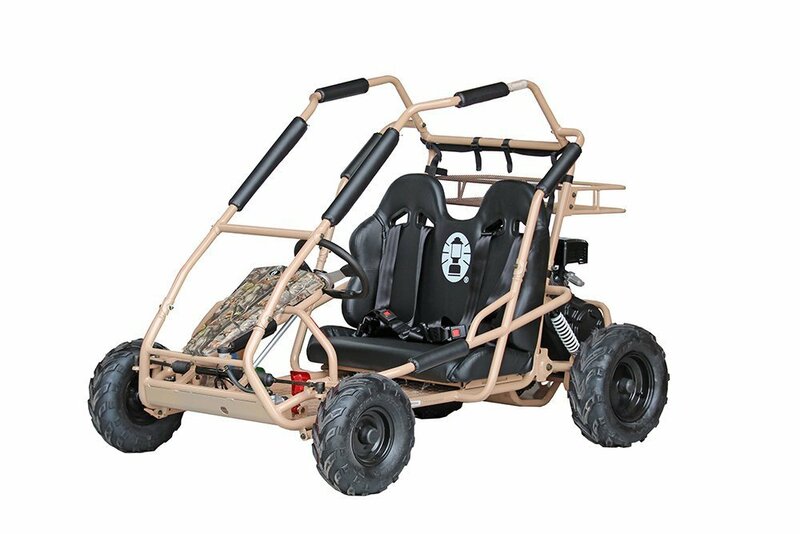 The reason is obvious, as this Go Kart is designed especially for trail racing purposes. The best thing about this vehicle is that it is powered by a powerful GY6 150 cc, single cylinder 4-stroke, Air-Cooled engine. The engine revs up enough power to carry two persons at a speed of up to 35 miles per hour. It has a light weight design suitable for trail racing. The twin seats are adjustable racing seats and are provided with a 4-Point harness for added safety and comfort. 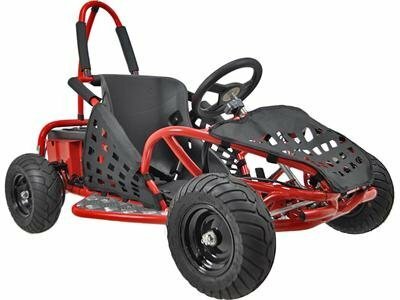 If you are looking for power along with good sporty looks, then this Go Kart makes an excellent choice. 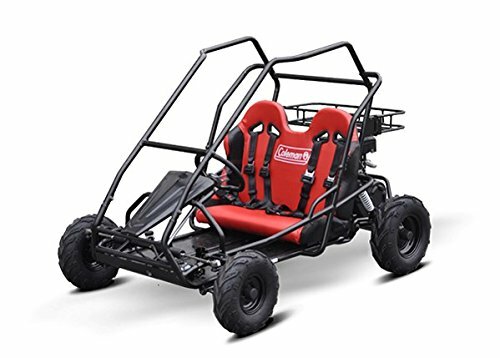 This XtremepowerUS Gas Off Road Go Kart looks similar to the MotoTec MT-GK-01 Go Kart in its exterior and dimensions. However, the difference lies in the fact that the latter is battery operated at 48V; whereas the XtremepowerUS Gas Go Kart runs on gas. 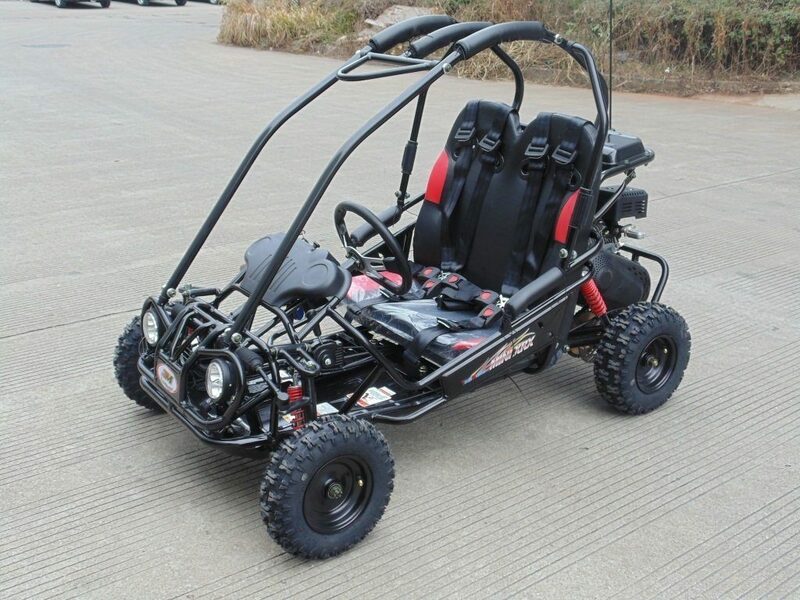 This XtremepowerUS Go Kart is powered by an 80CC OHV, 4 Stroke Engine that belts out 2.5 HP of power. The vehicle is EPA approved. For added safety, it has a protective roll cage fashioned out of durable tubular steel frame. Like big cars, it also sports hydraulic disk brakes. It has 13-inch pneumatic wheels with steel rims. With a load of 190 pounds, it can attain a maximum speed of 20 miles per hour. 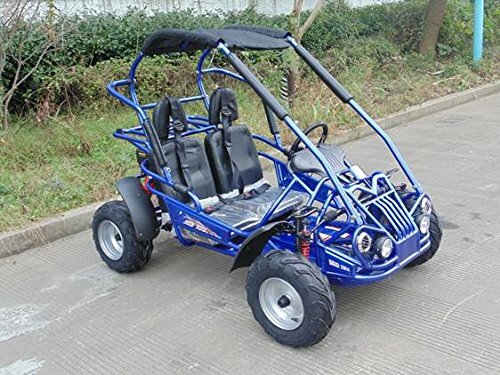 This Go Kart is recommended for children above 13 years of age. This Kandi 150cc Go Kart is powered by a single cylinder engine which delivers a maximum torque of 6.6 pounds per square feet at 5500 rpm. The air-cooled engine pumps out 10.5 horsepower which enables the Go Kart to attain a maximum speed of 36 mph. This makes it a powerful Go Kart that can pick up speed very fast. It has a fully automatic transmission with reverse gears. It has electric ignition, adjustable seats, conveniently located floor gear shifter for forward, neutral and reverses. It is made of heavy gauge steel frame with dual front A-arm coil-over-shock suspension. At the rear too, it has swing-arm dual coil-over-shock suspension. It is also equipped with integrated side and upper brush guards. It has been provided with safety features such as front and rear disc brakes, dual 4 point seat harnesses, padded frame guard bars and steering wheel. There is a rear safety net installed behind the seats so that the riders can be protected from flying debris from the rear wheels. 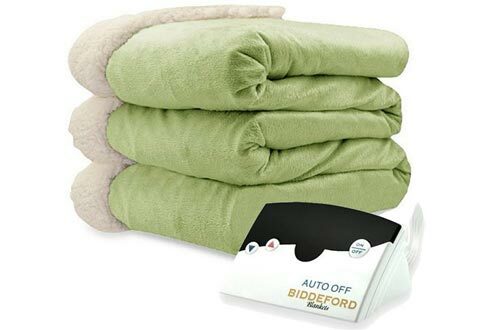 Among other features are headlights, fog lights, rear tail lights, turn signal indicators, horn, side rear view mirrors and other features that are found in bigger cars. 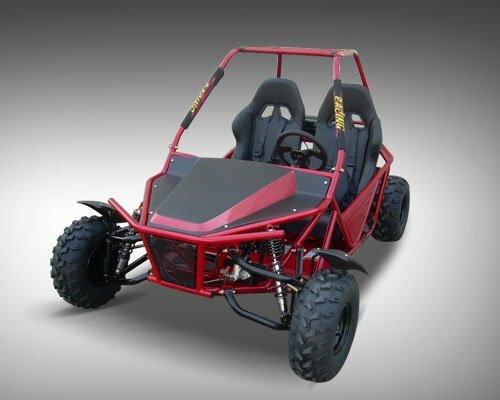 Trailmaster XRX-R is a powerful mid-size Go-Kart with a 200 cc single cylinder, air-cooled engine. The engine delivers 6.3 HP of power at 3600 RPM and belts out a torque of 9.6 pounds per square feet at 2500 RPM. It reaches a maximum speed of 31 MPH. The 200 cc engine is large among its class with reverse gears. It also has an electric start with a pull-start backup. Disc brakes are provided for instant and sure stops. 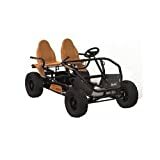 This Go Kart is perfect for kids from 8 to 14 years of age, as it has a high back dual seat that is comfortable for two persons. The back of the seat to paddle distance can be adjusted from 31.5 to 37 inches for a comfortable riding position. 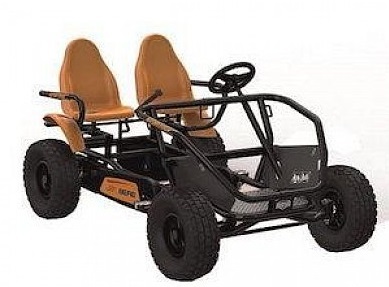 This Go Kart is made with a tubular steel heavy-duty frame. For safety and protection, it has a full upper roll cage, side rails, and an enclosed belly pan. Coleman CK100-S Go Kart has a powerful 98 CC Four-stroke engine that can be started with an easy pull start operation. Once this single cylinder OHV engine roars into life, it develops 3 HP power. 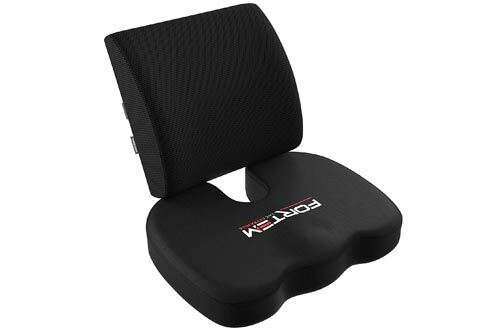 It can easily carry a rider weighing up to 150 pounds. It has hydraulic disc brakes on the rear wheels which are operated by foot. The pneumatic low-pressure tires absorb the shock and jerks of the uneven trail and provide a soft comfortable ride. This is another model of Coleman Go Kart, Coleman KT-196C. It is also powered by a 196 CC Four-stroke OHV single cylinder engine that delivers 6.5 HP. You can start the engine with its easy pull start operation. The transmission is fully automatic with a torque converter CVT system. 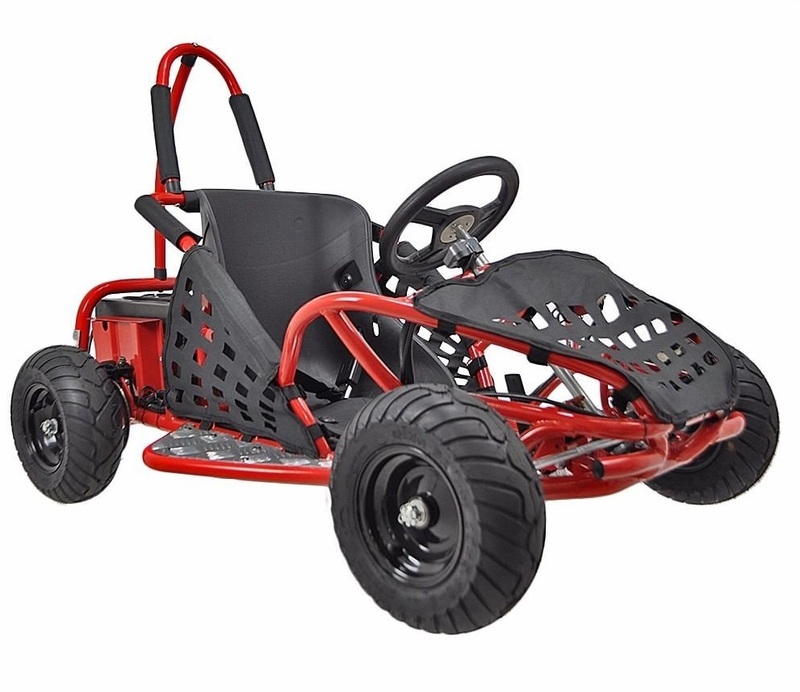 The Go Kart comes with a rack and pinion steering and is equipped with hydraulic disc brakes. The roll cage has been padded for added safety. There is absolutely no comparison of other Go Karts with the Coleman family of Go Karts. All Coleman Go Karts are made with the best quality materials and with an emphasis on safety. For sheer performance, these Go Karts are the best in their class. The Coleman KT196 Off Road Go Kart is equipped with a powerful 4 stroke OHV single cylinder 196cc engine. This extremely capable engine delivers 6.5 HP at 6300 RPM. It has a torque converter CVT system for smooth power delivery to the wheels. Rack and pinion steering like a big car make it convenient and easy to drive around. Hydraulic disc brakes come with a standard fitment. It has an easy pull start operation. For safety, there is a roll cage with ample padding. With a top speed of 31 MPH, it is suitable for children who are 13 years or more in age. With a payload capacity of 400-pound and more, it can carry two persons with ease and comfort. 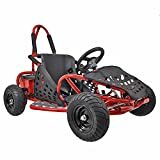 The Coleman KT196 is a reliable and affordable Go Kart which is also durable and will continue to provide fun and excitement for a long time to the entire family. While choosing an Off Road Go Kart, you need to consider whether you want a single, double or more passenger capacity vehicle. Then you have to decide whether you require a fuel-powered or an electric-powered vehicle. The latter is silent and smooth to ride but have a limited range till they are charged again. You need to consider the safety aspects as well. This list will help you in short-listing your choices and zero-in on the Go Kart that is ideal for your requirements.